After a period of successes and failures, that culminated with winning an Oscar for Traffic in 2000, the next phase of Steven Soderbergh’s career was a mixture of commercially-viable pictures and experimental works. He challenged himself creatively and took a more hands on approach in regards to cinematography and editing. 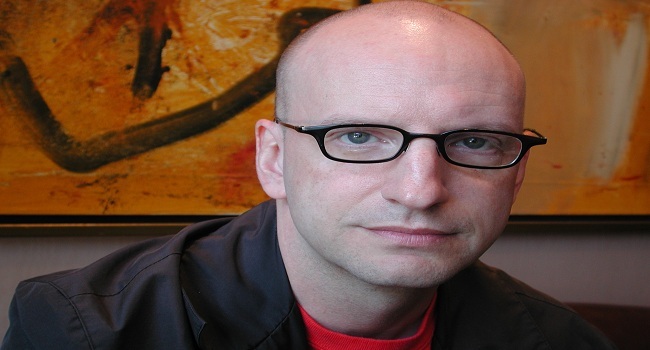 Becoming a major player in the industry, Soderbergh also produced films for fellow directors – such as Todd Haynes, Christopher Nolan, and Richard Linklater – through the Section Eight company which he co-founded with George Clooney. Famed film producer Jerry Weintraub approached Soderbergh about possibly doing a remake of the 1960 Rat Pack film Ocean’s Eleven. Soderbergh was intrigued by the project and hired Ted Griffin to write the script. 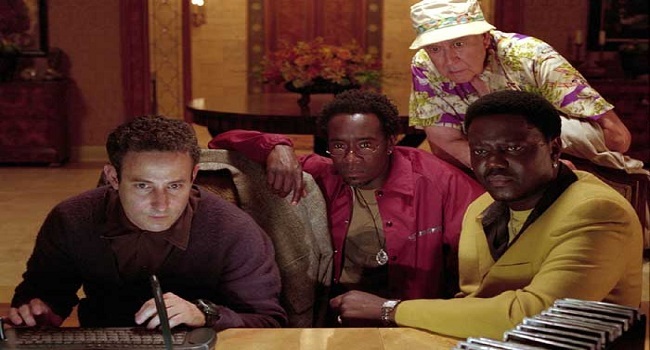 While the updated version still focused on a group of men coming together to rob a casino, Soderbergh’s wanted the film to have an airy feel to both its comedy and performances. Infusing some well-placed twists into the story, Soderbergh’s version still managed to capture the sense of togetherness that was in the original film. Shooting largely on location in Las Vegas, Soderbergh enlisted George Clooney to play the lead role of Danny Ocean. Andy Garcia got the role of the antagonist Terry Benedict; and Julia Roberts, jokingly getting an “introducing” credit, played Danny’s former flame Tess. The rest of the ensemble cast included Don Cheadle, Eddie Jemison, Elliott Gould, Brad Pitt, Matt Damon, Bernie Mac, Casey Affleck, Scott Caan, Carl Reiner, and Shaobo Qin. Soderbergh decided to have Angie Dickinson and Henry Silva make cameos in the film as an homage to the 1960 version. Ocean’s Eleven was a huge hit with audiences and critics. The film made $450 million worldwide and received glowing reviews from the press. Soderbergh used the success of the film to fund his own projects as well as projects for other filmmakers. Wanting to break away from big-budgeted filmmaking, Steven Soderbergh decided to work on an experimental film about a day in the life of a group of friends in Hollywood. Gathering for a birthday party, the friends lives unfold in a film-within-a-film structure. Full Frontal explored the disintegrating relationships and sexual dynamics in two different worlds where reality and fiction blurred. At the forefront of the emerging digital filmmaking movement, Soderbergh shot much of the film’s main narrative with a Canon XL-1s. Paying homage to the French New Wave era, and with a budget of $2 million, Soderbergh’s ensemble of actors were willing to take a pay cut to work with the director. This cast included Julia Roberts, Catherine Keener, Nicky Katt, David Hyde Pierce, David Duchovny, Mary McCormack, and Blair Underwood. The director even got Brad Pitt and Terence Stamp to make cameo appearances. Full Frontal received negative reviews when it hit theaters but, to the directors surprise, still managed to make over $3 million at the box office. 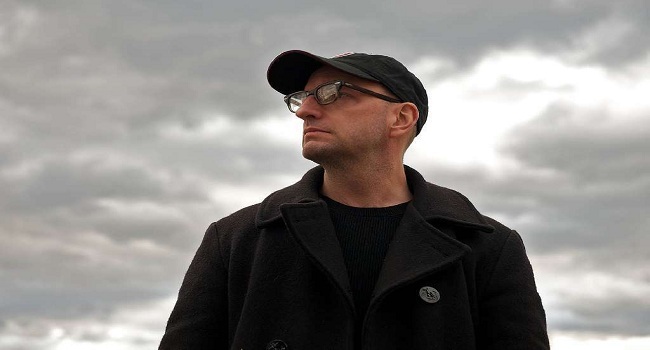 During the making of Traffic, Steven Soderbergh was approached by James Cameron about helming a new adaptation of Stanislaw Lem’s 1961 novel Solaris, which had been previously adapted into a film back in 1972 by Andrei Tarkovsky. Soderbergh wrote the script himself and infused elements based on the disintegration of his marriage to actress Betsy Brantley in the 1990s. The story revolved around a scientist, Chris Kelvin (George Clooney), who, while investigating a matter at a space station close to a mysterious planet, is visited by a manifestation of his late wife (Natasha McElhone). Shot in a studio in Los Angeles, Soderbergh crafted a film that was more of an interpretation of the story rather than a typical remake. His version pays more attention to Kelvin’s own grief than the original. His hypnotic tale brought a mixture of romance, grief and terror to the science fiction genre. 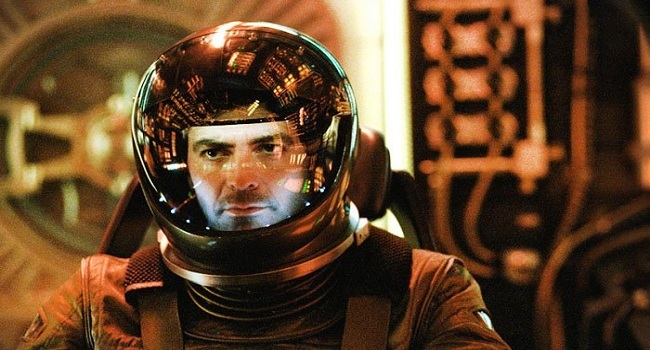 Prior to its release, Solaris endured a ratings dispute with the MPAA over scenes featuring George Clooney’s bare buttocks. Ultimately getting re-rated to PG-13, the film received excellent reviews with some critics praising it over Tarkovsky’s version. Despite the praise, the film only made $30 million worldwide against its $47 million budget. Soderbergh and Clooney felt that the poor marketing by 20th Century Fox led to the poor box office. After taking a break from films to helm the short-lived HBO political series K Street, Soderbergh was asked to take part in an omnibus film called Eros. Focused on themes of eroticism, Soderbergh was joined by famed Hong Kong filmmaker Wong Kar-Wai and the legendary Italian filmmaker Michelangelo Antonioni for the project. Soderbergh’s segment, entitled Equilibrium, involved a man (Robert Downey Jr.) sharing his fantasies and sexual repressions with a voyeuristic therapist (Alan Arkin). 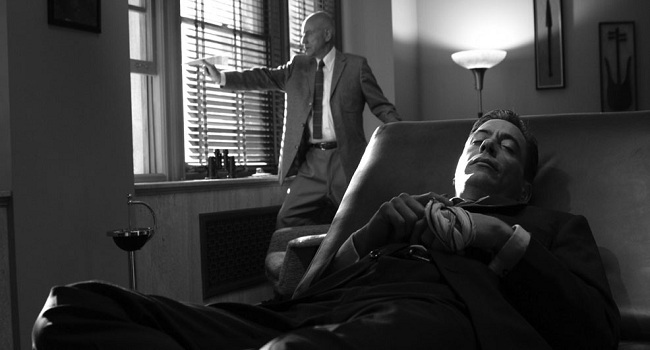 The scenes with the therapist were shot in black-and-white, while the fantasy sequences – which featured Downey’s object of affection played by model Ele Keats – where filmed in color. Thanks to the way he incorporated humor into the piece, Soderbergh’s segment was considered the most entertaining by some of the critics that attended the Venice premiere in September of 2004. It took almost a year for the film to get a U.S. release, and Eros failed to garner much interest when it finally hit theaters. Considering that the success of Oceans’ Eleven gave Soderbergh financial stability to make more experimental films, he decided to return to the franchise with Ocean’s Twelve. The sequel had Danny Ocean and his gang traveling to Europe to pay back all of the money that they stole from Terry Benedict. During the trip the gang contends with another thief, Night Fox (Vicent Cassel), and an Interpol agent, Isabel Lahiri (Catherine Zeta-Jones), who happens to be Rusty’s (Brad Pitt) former flame. Dubbing the film an anti-sequel, Soderbergh shot the film in Amsterdam and Italy. Treating the production like a paid vacation for the cast, there was a loose vibe to the plot and overall humor. The film featured numerous jokes such as the one in which Tess (Julia Roberts) must assume the identity of movie star Julia Roberts. Another one of the great pop culture moments in the film involved Linus (Matt Damon) reciting lyrics from Led Zeppelin’s Kashmir in order to pass a test. Ocean’s Twelve received mixed reviews from critics, but was a major success financially making over $360 million worldwide. Aside from solidifying Soderbergh as a major player in Hollywood, the director cited the film as one of his favorites from his canon of works. 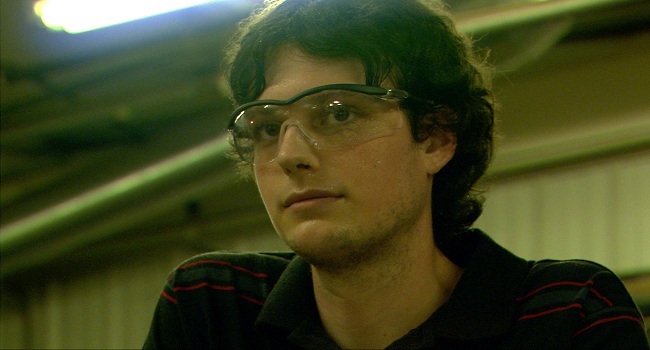 Going back to the world of experimental films, Soderbergh decided to re-team with Full Frontal writer Coleman Hough for a project that ventured into minimalist filmmaking. Bubble focused on a doll factory worker in her mid-40s (Debbie Doeberenier) whose friendship with a fellow co-work (Dustin James Ashley) is threatened when a new employee (Misty Dawn Wilkins) is thrown into the mix. Inspired by the methods of Robert Bresson, Soderbergh decided to cast non-actors in the lead roles. Hough essentially wrote an outline for the events and Soderbergh relied on the actor’s improvisation to flesh out the scenes. In hopes of creating something that felt natural, Soderbergh shot on location in West Virginia and rural Ohio using high-definition digital video. The film was a visual improvement over Full Frontal as Soderbergh captured life in a small town in way that was not often seen in film. He also hired former Guided by Voices vocalist Robert Pollard to craft a score that maintained an eerie momentum in the film’s drama. Bubble premiered at the 2005 Venice Film Festival before getting an unconventional, at the time at least, release. Since the film was unlikely to do well at the box office, Soderbergh decided to release the film both in theaters and on cable/satellite channel HDNet Movies on the same day. 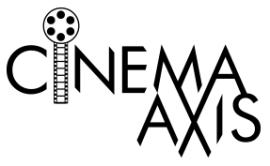 The film served as the basis for the video-on-demand release model that many studios now use for their independent film distribution. Steven Soderbergh’s next was a stylized adaptation of a Joseph Kanon novel that paid homage to the noir films of the 1940s. 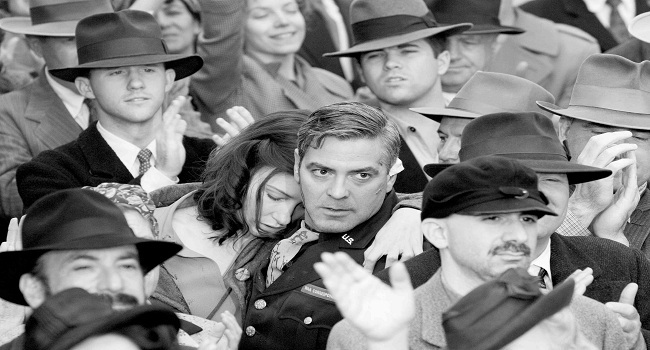 Set in Germany, during the Postdam Conference in the aftermath of World War II, the story revolved around war correspondent Jake Geismar (George Clooney) and his former lover Lena Brandt (Cate Blanchett) trying to solve the mystery of a murder soldier (Tobey Maguire). Soderbergh worked hard to recreate an old cinematic feel to the film. Hiring Thomas Newman, whom he worked with on Erin Brockovich, to handle the music, the score nicely capture the paranoia of the era. The Good German was a commercial disappointment when it debuted in theatres. Despite the star power, the film only made $5 million against its $32 million budget and received a lukewarm critical reception. Despite receiving an Oscar nomination for Thomas Newman’s score, the film was one of the last releases from Soderbergh/Clooney’s Section Eight company. The company folded just after the film’s theatrical release. After the disappointing reaction towards The Good German, Soderbergh decided to return to the profitable Ocean’s franchise. Once again setting it in Las Vegas, the film was a revenge story involving Danny Ocean and his gang taking on a casino owner, Willy Banks (Al Pacino), who ripped off Ruben (Elliott Gould). The cast this time around expanded to include David Paymer as a hotel critic, and Ellen Barkin as Banks’ right-hand woman. Maintaining the sense of fun that the series had become known for, Ocean’s Thirteen once again balanced comedic and heist genre elements. This time around the gang was more focused on ruining the opening night of Bank’s casino than they were with stealing cash. Much of the humor involved disguises and misdirection. Some of the biggest laughs come in scenes when Linus must wear a fake nose and Basher (Don Cheadle) is forced to impersonate an American stuntman. Ocean’s Thirteen played out of competition at the 2007 Cannes Film Festival and was a huge success when it was released weeks later. Earning over $300 million worldwide, the film received better reviews than its predecessors. The film marked an end of an era for the franchise as it was one of the last films that Bernie Mac made before his unexpected passing a year later. In the late 1990s, Benicio del Toro and producer Laura Bickford gained the rights to film a biopic on the life of the revolutionary Argentine Marxist Che Guevara. Adorned on t-shirts nowadays like a pop culture icon, Guevara was a political activist who, of the many memorable moments of his life, helped Fidel Castro overthrow Fulgencio Batista’s dictatorship of Cuba. Bickford and del Toro approached Terrence Malick to direct the film since he had gone to Bolivia as a journalist in the 1960s to cover Guevara’s campaign. Malick was on board for a year-and-a-half until financing fell apart and the opportunity to make The New World arose. During the production of Traffic, del Toro and Bickford told Soderbergh about a project, who was intrigued by the idea of directing it himself. Soderbergh decided to bring in Peter Buchman to help write a script, and used Malick’s idea to turn the project into a two-part film. The first part covered everything from Guevara’s rise during the July 26th Movement to his address at the United Nations in 1964. The second part revolved around the events that ultimately led to his fall in Bolivia. Soderbergh and del Toro decided to shoot the scenes at the United Nations building in 16mm, before its renovation in 2006. The footage helped Soderbergh to secure the money he needed to shoot the two films back-to-back. Having followed the development of digital cameras, Steven Soderbergh decided to shoot both films with one of the first RedOne digital cameras. He also used different aspect ratios, and in various styles, to create two films that were vastly different from the conventional biopic. Che premiered as one entire four-hour plus film at the 2008 Cannes Film Festival. Benicio del Toro walked away with the Best Actor Prize for his portrayal of the controversial figure. The films received a special roadshow release in New York City and Los Angeles, for its Oscar consideration, and was shown on-demand through the Independent Film Channel. Though the two films got excellent reviews, its box office take was only $40 million worldwide against its $58 million budget. Wanting to do something much smaller than his last feature film, Soderbergh returned to his experimental digital filmmaking with The Girlfriend Experience. The script by Brian Koppelman and David Levien, who had written Ocean’s Thirteen, followed a high-class call-girl (Sasha Grey) whose personal life unravels due to the financial crisis of 2008. With a budget of $1.3 million, Soderbergh decided to go for a low-key approach similar to the one he employed for Bubble. Steven Soderbergh went for a cinema verite style that was inspired by the works of Michelangelo Antonioni and Ingmar Bergman. He used it to showcase both Grey’s naturalistic qualities, as well as the way the economy was impacting people from every walk of life. A rough cut of The Girlfriend Experience made its debut at the 2009 Sundance Film Festival before getting both a limited theatrical and on-demand release. While the film received mixed reviews, it did prove that Soderbergh still had something interesting to say. Heading back to more mainstream filmmaking, Soderbergh decided to adapted Kurt Eichenwald’s novel The Informant!. 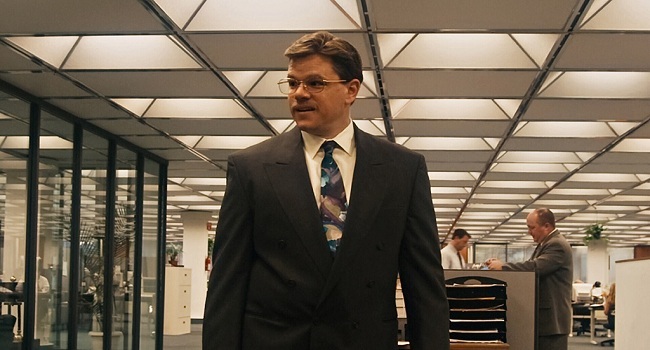 The true life story focused on Mark Whitacre (Matt Damon) who became a whistleblower for a lysine price-fixing conspiracy in the 1990s. Playing up the books offbeat sense of humor, Soderbergh hired famed music composer Marvin Hamlisch to accentuate the comedic beats in the film. He also showcased the extent of Whitacre’s delusional state by filling out the supporting characters with a rather grounded group of actors. These actors included Scott Bakula, Melanie Lynskey, Joel McHale, Eddie Jemison, Ann Dowd, Candy Clark, and the Smothers Brothers. The Informant! received excellent critical reviews upon its release. It grossed more than $41 million worldwide against its $22 million budget; and garnered Matt Damon a Golden Globe nomination for Best Actor in a Comedy/Musical. The film also marked the beginning of several collaborations between Steven Soderbergh and screenwriter Scott Z. Burns. 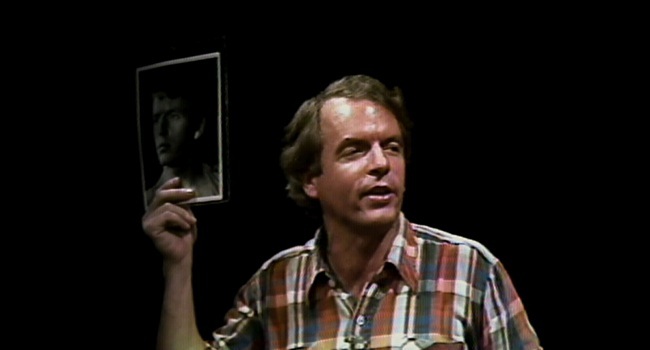 Having felt that he owed much of his success to the monologist Spalding Gray – as Gray’s Anatomy gave him an artistic wake-up call in the mid-1990s – Steven Soderbergh spent several years crafting a documentary about Gray’s life following the performers suicide in 2004. With the help of editor Susan Littleburg, Soderbergh gathered footage of interviews with Gray, and various stage performances, and pieced them together in a way that allowed Gray to tell his own life story. Soderbergh asked Gray’s son, Forrest, to do create a score that was upbeat in tone but had shades of melancholy. The film premiered at the 2010 Slamdance Film Festival and was a hit on the festival circuit. Though he was unable to secure a theatrical release, And Everything is Going Fine was eventually released on DVD/Blu-Ray through the Criterion Collection two years later. Contagion found Soderbergh tackling a multi-layered story that focused on a group of people struggling to survive a viral epidemic. The film not only showed the struggles that doctors and average citizens endured, but also the media reaction through the eyes of a local blogger. With the exception of Matt Damon and Elliott Gould, Soderbergh decided to work with actors he had never worked with such as Laurence Fishburne, Kate Winslet, Gwyneth Paltrow, Jennifer Ehle, Marion Cotillard, John Hawkes, Bryan Cranston, and Jude Law. Filmed in various locations – including Atlanta, Minneapolis, San Francisco, Hong Kong, Geneva, Tokyo, and London – Soderbergh captured the global paranoia and fear that modern society had displayed during real-life epidemics like SARS. He also showed how certain individuals, such as the blogger Alan Krumwiede (Jude Law), manipulate moments of crisis for personal profit. The film effectively mixed moments of touching human drama with elements found in political thrillers. 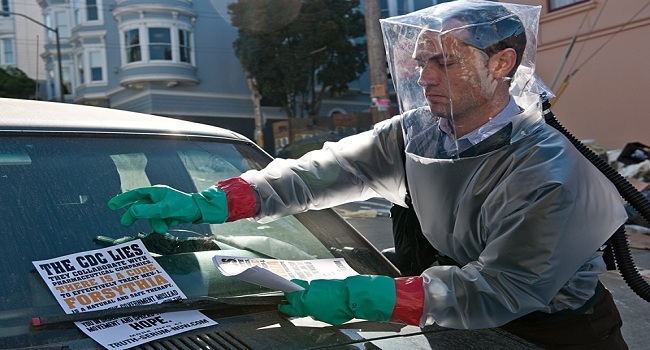 Contagion debuted at the 2011 Venice Film Festival prior to hitting theatres a few weeks later. The film not only grossed $135 million against its $60 million budget, but was well-received by critics as well. In late 2009, Steven Soderbergh and Lem Dobbs discussed making an action film that both had commercial appeal but also offered something different from what was normally associated with the genre. The result was Haywire , a tale about a woman, Mallory Kane (MMA fighter Gina Carano), working for a private organization that specializes in retrieving hostages and getting rid of problems that normal government channels cannot handle. When Mallory is betrayed by her handlers, she sets out to uncover the bigger conspiracy at play. Much of the narrative was told via flashback with the latter half focused on Mallory exacting her revenge. Taking a risk by placing Carano, who had limited acting experience at the time, in the lead role, Soderbergh filled out his supporting ensemble with the likes of Michael Douglas, Michael Fassbender, Bill Paxton, Antonio Banderas, Channing Tatum, Michael Angarano, and Ewan McGregor. This not only provided support for Carano but also led to some very dynamic, and surprising, fight scenes. Due to some delays in the post-production, including time Soderbergh took to do some sound mixing work on Carano’s voice, Haywire premiered at the AFI Film Festival in the fall of 2011. The film was officially released in theatres in January of 2012 and received excellent reviews from critics. The film also did modestly well in theaters grossing more than $33 million worldwide against its $22 million budget. Having met Channing Tatum during the filming of Haywire, Soderbergh was approached by the actor regarding a possible project based on Tatum’s experiences as a male stripper. Tatum and his friend Reid Carolin had written a script that Nicholas Winding Refn was originally going to direct. Steven Soderbergh agreed to step in and Magic Mike came together rather quickly after that. The story revolved around a male stripper, Magic Mike (Channing Tatum), taking in a young college dropout, the Kid (Alex Pettyfer), under his wing while struggling to figure out his own direction in life. Featuring a supporting cast that included Matthew McConaughey, Olivia Munn, Joe Manganiello, Matt Bomer, and former pro wrestler Kevin Nash, Magic Mike was about much more than a group of men partying their way through life. Soderbergh focused heavily on the theme of finding direction in one’s life. The film tackled the unexpected ways that maturity, responsibility and ambition can send people in different directions. Magic Mike was another critical and commercial hit for Soderbergh. The film stunned pundits by making $167 million at box office against its $7 million budget and solidified Channing Tatum as a viable star. Intrigued by the increased use of prescription pills in modern society, Soderbergh’s next film was a suspenseful drama set within the pharmaceutical industry. Originally titled Bitter Pill, Side Effects revolved around a woman, Emily (Rooney Mara), whose life starts to unravel as a result of the prescription drugs she is prescribed for her depression. The first half of the film explored Emily’s depression and how it impacts the relationship with her husband (Channing Tatum). The latter section focuses on Emily’s doctor (Jude Law) and her former shrink (Catherine Zeta-Jones) as they deal with the ramifications of Emily’s action. Despite its seemingly straightforward approach, Soderbergh sprinkled in several twist and turns into the film. He not only presented an interesting commentary on the unhealthy union between the medical profession and pharmaceutical companies, but also crafted an engaging thriller as well. Marking Soderbergh’s last theatrical release, Side Effects was well-received critically and commercially. For several years, Steven Soderbergh had been interested in making a film about the life of the famed pianist Liberace. He even approached Michael Douglas during the production of Traffic about playing the lead role. The idea languished in development for years as many studios deemed the film to be “too gay” for mainstream audiences. 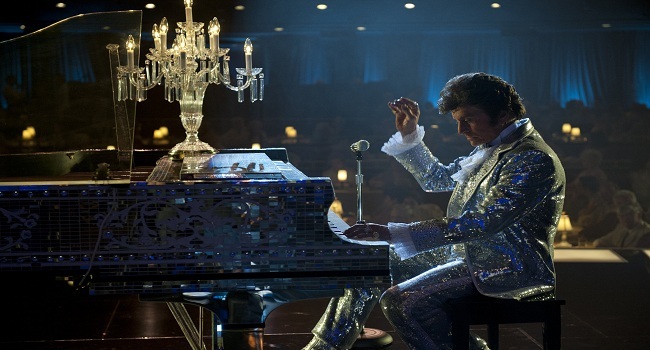 The film found new life in 2008 when Soderbergh hired screenwriter Richard LaGravenese to write a script based on Scott Thorson’s memoir Behind the Candelabra: My Life with Liberace. Soderbergh’s film focused on the last ten years of Liberace’s (Michael Douglas) life, as seen through the eyes of his lover, Thorson (Matt Damon). The film focused heavily on Liberace’s relationship with Thorson all the way up to his death in 1987. The fact that the film was primarily love story between two men, set during a time when homosexuality was frowned upon, added a layer that was unique from other biopics. Through the work of producer Jerry Weintraub, Soderbergh eventually found financial backing from the cable network HBO. With a budget of $23 million, the supporting cast was expanded to include Debbie Reynolds, Dan Aykroyd, Rob Lowe, Cheyenne Jackson, Paul Reiser, Tom Papa, Scott Bakula, and Nicky Katt. Soderbergh also managed to gather musical pieces from Marvin Hamlisch just before his death in the summer of 2012. Behind the Candelabra premiered at the 2013 Cannes Film Festival to a rousing reception. A few days later it debuted on HBO to further acclaim. The film even won two Emmys in the Best Actor and Best Director categories. Soderbergh’s latest project is a period drama set at the Knickerbocker Hospital in 1900 New York City. 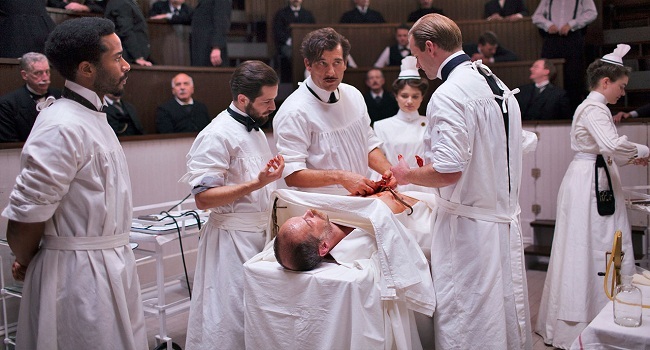 The Knick focuses on the exploits of Dr. John “Thack” Thackery (Clive Owen) and his staff. Thackery not only struggles with his cocaine and opium addiction, but conducts surgeries that are both groundbreaking and subversive. The Knick premiered on Cinemax in August of this year and has garnered excellent reviews. The series has already been renewed for a second season. Throughout Soderbergh’s career, there have been several projects he had been attached to that were never realized. The most notable was the adaptation of Michael Lewis’ book Moneyball about the 2003 Oakland Athletics and its general manager Billy Beane. Using Steve Zaillian’s script as a guideline, Soderbergh’s plan was to make something that mixed documentary and drama together. Filming was set to begin in June of 2009 but halted for numerous reasons. Sony eventually, to shock of many in the industry, dismissed Soderbergh and brought in Bennett Miller to direct a version of the film based on Aaron Sorkin’s script. Other projects that Soderbergh wanted to do included a musical based on the life of Cleopatra that was to star Catherine Zeta-Jones; and a film version of the 1960s TV show The Man from U.N.C.L.E. Both projects fell apart due to budgetary reasons, though a version of The Man from U.N.C.L.E., directed by Guy Ritchie, is set to come out in August of 2015. Having directed over 20 films in the span of 25 years, there is no question that Steven Soderbergh has made a major impact in the world of cinema. Whether it’s through art-house indies or mainstream studio films, he proved that it is possible to be an independent voice within a money-driven industry. Though he’s still involved in the film industry through other avenues, many wonder if Soderbergh will ever make another feature film. Regardless, he has cultivated one hell of a career. It will be a long time before the film industry sees a director as prolific and daring as Steven Soderbergh. Brilliant overview of Soderbergh’s work. I’ve enjoyed a lot of his work but find his appeal with me personally has remained hit and miss. I wasn’t a fan of Magic Mike in recent years and yet I absolutely loved Behind the Candelabra. Thanks. It wasn’t easy as I had to watch several films of his that weren’t easy to find but now that I’ve done pretty much all of his films. I can proudly say that he had one hell of a career.